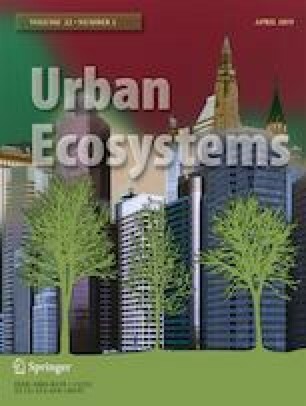 Urban trees are getting increasing attention as a tool to mitigate urban heat island effects. A more functional and quantitative view of transpirational and shading effect, particularly the magnitude of both surface and air cooling potential can further strengthen motivations for urban tree planting. We investigated the transpirational and the surface cooling potential of two contrasting tree species in Munich, Germany: ring porous Robinia pseudoacacia L. and diffuse porous Tilia cordata Mill. Throughout the summer 2016 we monitored meteorological and edaphic variables and tree sap-flow along with the air temperature within and outside tree shade at different heights. With 30% higher leaf area index (LAI), double sap-flux density and sapwood area, T. cordata trees showed three times higher transpiration compared to the R. pseudoacacia. Consequently, T. cordata trees showed higher within canopy air cooling effect. Surface cooling (∆Tshade) were higher under the denser canopies of T. cordata compared to R. pseudoacacia for asphalt surfaces but ∆Tshade for grass surfaces were not significantly different under the canopies of two species. Linear regression indicated a decrease in grass surface temperature of 3 °C with every unit of LAI but for asphalt, the reduction in surface temperature was about 6 °C. Additionally, higher water using efficiencies of R. pseudoacacia coupled with higher soil moisture and radiation probably increased the grass evapotranspiration and subsequently showed positive relationship with the near ground air cooling. Therefore, species with higher canopy density might be preferred over asphalt surfaces but low water using species with lower canopy density could be chosen over grass surfaces. This study was carried out while the corresponding author was in receipt of an Alexander von Humboldt Fellowship and grant from TREE Fund (#: 15-JK-01). There was no involvement of the sponsors in study design; in the collection, analysis and interpretation of data; in writing the report; and in the decision to submit the article for publication. The authors want to thank the department for the municipal green areas of Munich, Dr. Bernhard Förster; Mrs. Anna Brähler; Mr. Chao Xu for their kind help. where ΔTM is the maximum temperature difference when sap flow is assumed to be zero.